A couple whose Coffey Park home burned down in the deadly North Bay fires said Wednesday they filed the first lawsuit alleging PG&E is responsible for their loss to find out the truth about what happened. The suit, filed by Wayne and Jennifer Harvell late Tuesday, comes as PG&E acknowledged Monday it told regulators about eight equipment failures related to the North Bay fires. The blazes have destroyed nearly 5,000 homes and claimed 42 lives. “For us, it’s about getting to the truth of what happened,” Jennifer Harvell, 54, told reporters outside the San Francisco civil courthouse. 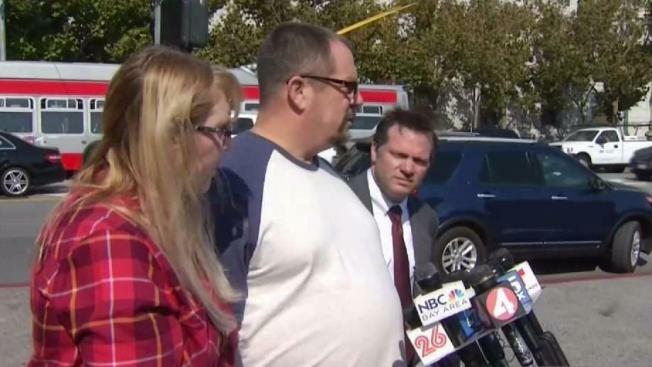 “If there is some responsibility to be borne by PG&E, or whoever, we need to find out,” Harvell’s husband, 58, added. The Harvells say they barely escaped the wrath of the Tubbs fire with their two dogs and two cats before it jumped Highway 101 and devoured their Mocha Lane home of 30 years. One of their sons, an Iraq war veteran, managed to salvage one of his dog tags from the rubble. The couple is now living in a hotel that will accept their pets. Their attorney, Bill Robins, flatly rejected the idea of waiting until after the official investigation is over to file his suit. “We have family here and many families whose lives have been completely destroyed,” the Santa Monica-based attorney said. Robins added that the origin of the fire coincides with reports of PG&E downed lines and transformer failure.